Everybody knows that breakfast is the most important meal of the day. Like a lot of people, I don’t always take time to have a good breakfast. Do what I say, not what I do you will say. Oatmeal is so easy to make and so healthy for you, me, us. It contains a lot of fiber, complex carbs and protein and it help lower cholesterol levels. It contains vitamin B, phosphorus and magnesium. 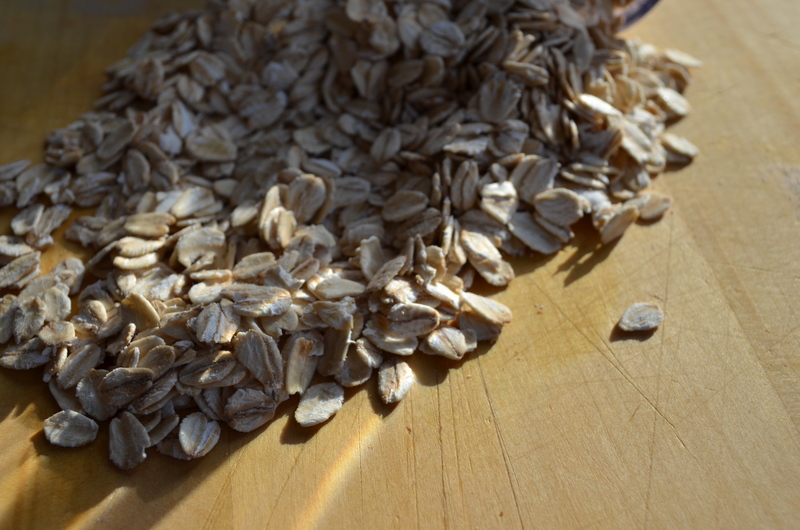 I use old-fashioned oats, not the instant stuff because I think it is better in terms of glycemic index. Instead of sugar, a natural sweetener like Stevia can be substituted. On weekends, I indulge with a bit of maple syrup. This recipe takes about 15 minutes to make and I am sure you will like it. I enjoy the plum puree rather on the tart side, but feel free to add more sugar if you like. Tell me what you think. 1. Put the oats in a saucepan with the water and the salt. Cook on medium-low heat for about 10 minutes. 2. In the meantime, cook the plum puree. In a saucepan, add the plums, ginger, maple syrup and the cardamom and cook on medium-low heat until the fruit falls apart and has the consistency of a puree. Take it off the heat and set aside. Add more syrup if you like. 3. In another pan, toast the pecans on medium heat for one minute or two. Add the syrup and toss until they start sticking together. Transfer on a piece of parchment and set aside. They should clump up. 4. 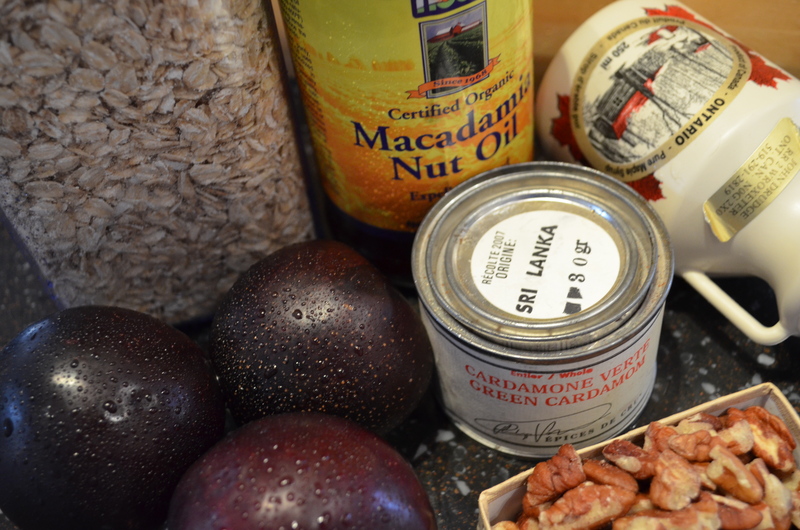 When the oatmeal is cooked to your liking, turn the heat off, add the macadamia nut oil and most of the plum puree. Mix a little, leaving beautiful dark streaks of fruit still visible. 5. 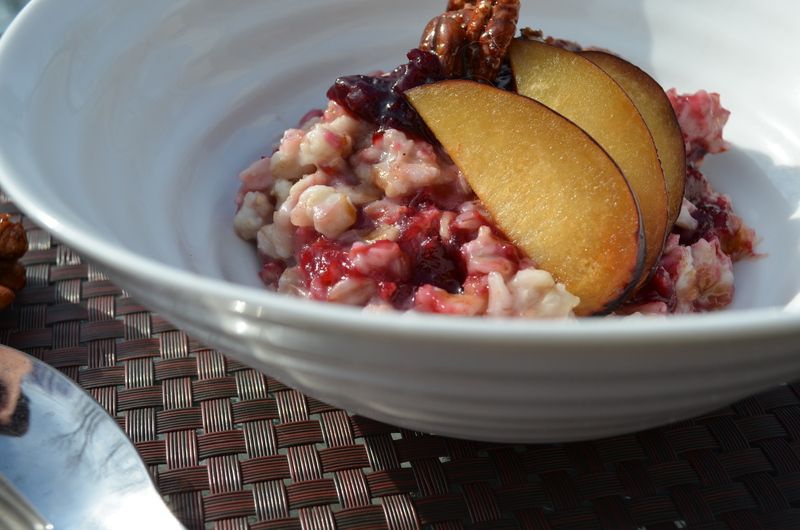 Transfer to a bowl and top with a spoonful of puree, fresh plum slices and the pecan pieces. Enjoy! This would make a great dessert, too!